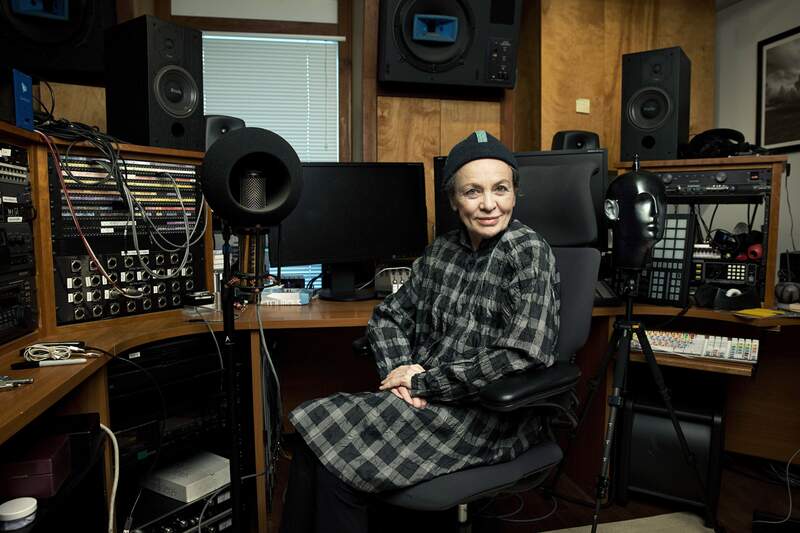 Musician, writer and artist Laurie Anderson at her Tribeca studio in New York City. Laurie Anderson, known for her use of technology in the arts, is creating a multifunctional exhibition space, audio archive and studio on permanent display at the Massachusetts Museum of Contemporary Art. The project opens Monday. NORTH ADAMS, Mass. – You are sitting, floating through the virtual clouds, when you hear that unmistakable voice coming through the headphones. The glittering buildings. Paper being shredded on the floor. 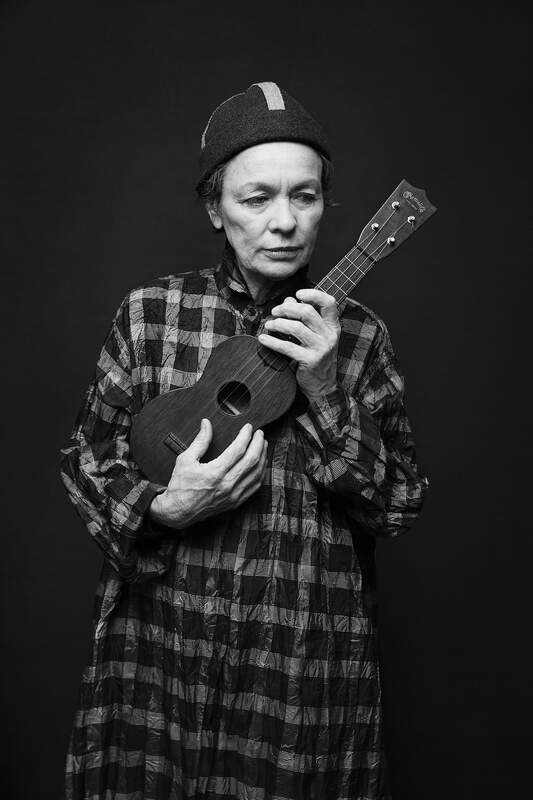 It is Laurie Anderson, the artist most famous for her fluke, 1981 hit “O Superman” but acclaimed for decades of creativity that have defied categorization. And this is “Aloft,” a new, virtual-reality piece at the Massachusetts Museum of Contemporary Art. Over her long career, Anderson has made films, invented instruments, played the world’s greatest concert halls and also given outdoor shows for dogs. But she admits she’s shocked that her latest project has come together. It is a 10,000 square-foot studio in Mass MoCA’s newly renovated Building 6 and will serve as both an artistic incubator and a place fans can see her work for at least the next 15 years. The Anderson project is part of a $65.4 million expansion at Mass MoCA, which has quietly become the country’s largest contemporary art campus. And talk of creating a space for the artist can be traced to a discussion at the museum nearly nine years ago when Mass MoCA director Joseph C. Thompson turned and asked her a question: What would a museum of Laurie Anderson look like? When the project finally came together several years later, Thompson called her back. Her tone, she admits, was different. He’s excited about not just the technology but the floor-to-ceiling illustrations Anderson painted of her late dog, a rat terrier named Lolabelle. She also does not particularly like being referred to as a storyteller, though that is effectively what she does, whether through music, film or interactive objects. The Mass MoCA space will feature “The Handphone Table,” a 1978 piece that allows visitors to feel sounds by simply leaning elbows on its surface. However she defines herself, Anderson’s work has stretched across decades, linking the experimental New York art scene of Yoko Ono and John Cage with Andy Kaufman, David Byrne and Philip Glass. In 1992, she began dating Lou Reed, whom she would eventually marry, the union ending only in his death in 2013. Reed is ever-present in Anderson’s life. She’s organizing his archives, has photos of him around her studio and incorporated his voice into her recent concerts with Glass. She remains as active as ever. On a recent weekday, in her studio on Canal Street in New York, she tried to simultaneously conduct an interview while tracing out text for a display at Mass MoCA, edit a book she’s put together related to what she lost in Hurricane Sandy and made a lunch reservation, for 10, to help celebrate a studio assistant’s birthday. She was also heading off to London for concerts with Glass. On the wall next to her is a list of projects, current and future – “Lou recordings Yellow Pony, Lesbos? Landfall, Connie Coverse” – that look as if they could keep the Museum of Modern Art’s curatorial department busy through the next presidential campaign. This, she says, is her norm. Or is it? “I always try to do too much,” she says. Anderson is particularly excited about the VR project, a collaboration with Taiwanese artist Hsin-Chien Huang. Visitors can experience two environments with goggles and a headset. In the first, “Aloft,” the walls of an airplane slowly fall away, leaving the visitor floating in the clouds. An array of objects hover around – a crow, a flower, a conch, a cellphone – and each can be grabbed and held onto. That’s when Anderson’s voice pops up, telling a story or quoting literature until you toss the object out into the sky. A second environment, “The Chalkroom,” features phrases and song lyrics painted in white on black walls. This may be the first virtual-reality project she’s presented, but she has tried before. Michael Morris, who as co-director of London’s Artangel has worked with Anderson since her “O Superman” days, remembers trying to pull off a virtual-reality project that she was collaborating on with Peter Gabriel in the early ’90s. It simply couldn’t work because of the limitations of technology. None of this surprises Roma Baran, her longtime musical collaborator. She remembers, back in 1980, hearing Anderson perform a piece driven by a rhythmic, repeating voice loop and a series of conversations processed into electronic layers through a vocoder. She told Anderson she should put that piece out on a record. Anderson resisted until, finally, Baran somehow persuaded her. That was “O Superman.” It rose to No. 2 on the British charts. “The idea that she would install something and kind of walk away and have people just dust it is not thinkable really,” she says.